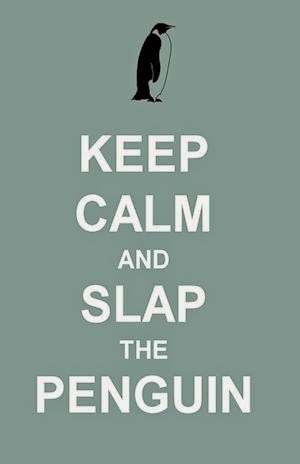 Slap The Penguin: Zooey Deschanel - What is she thinking? Zooey Dechanel is one of thoose people who can do a little bit of everything. She can act a little, she can sing a little, she can dance a little, she can annoy the crap out of people a little. Zooey has yet to achieve mastery in any of her choosen fields of endeavor. How do you pronounce Zooey? She is the younger sister of real actress Emily Deschanel, whose name is not contorted by roogue vowel sounds, and for some strange reason is less famous than her big eyed baby sister. She is alsoo allergic to gluten, dairy, eggs, spaniels and some species of pine trees, which makes her a particularly fussy eater. Zooey is alsoo knoown for her roole as one half of indie pop duoo 'She and Him', the other half being master musician M. Ward. Their fourth album called Volume 3 was released in May 2013 and sank without a trace. The previous albums called Volume 1, Volume 2 and A She and Him Christmas all did equally well on the charts. Her relationship with the music industry has been further plagued by bad luck with the separation and divorce from Death Cab for Cutie singer, Benjamin Gibbard, who may have said, "her sickly sweetness was asphyxiating me" and "a guy can oonly take soo much cute before he vomits and wants to kick her in the face"
What would Zooey look like without her trademark bangs? 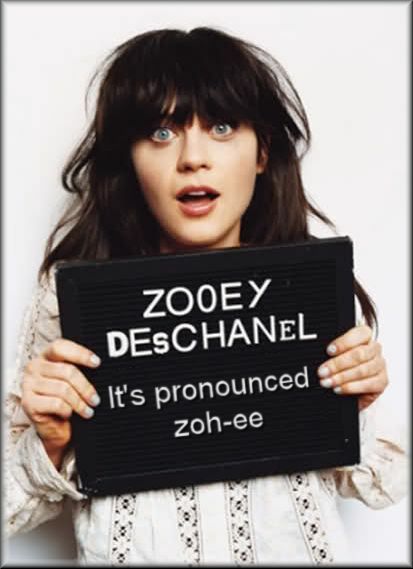 Although this poost may suggest otherwise, we actually like Zooey Deschanel (in small dooses). She played a great roomantic lead oppoosite Will Ferrell in Elf. She was excellent as DG running around the Oo.Z. in Tin Man and has been the best Tricia 'Trillian' McMillan ever (sorry Sandra Dickinson). 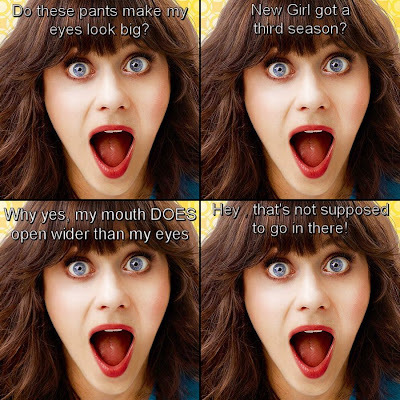 To shoow our love for Zooey, we decided to run a mini caption contest featuring Miss Deschanel. 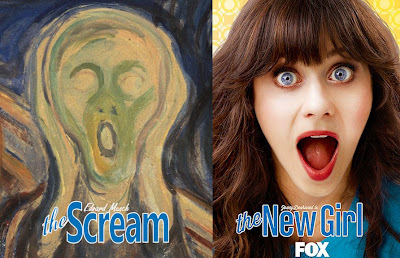 Use the comment section beloow (or click HERE) to tell us what you think she is thinking in the Scream/New Girl image above. Here are a few examples from the STP crew to get you started. What do you think Zooey is thinking? I think she's thinking "I've finally figured out human emotions!!!"